Los Angeles Pop Art, online at lapopart.com, is the leader and originator of text based artwork. All of their designs are created using words such as lyrics and scripts to create unique and amazing designs. The words themselves make up the artwork. All of the artwork is created by hand and celebrates some of the most iconic images pop culture has offered up over the last 50 years. Los Angeles Pop Art strives to create and offer a high quality product at an affordable price. Find smart and trendy t-shirts, hoodies, posters and bags that you'll love. First stop by 58coupons and checkout the latest lapopart.com promo codes, savings and discounts. 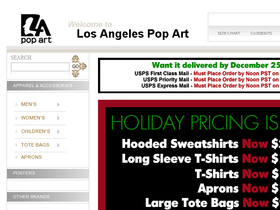 Enjoy free shipping on orders over $25 from Los Angeles Pop Art. Follow this link and start shopping. Visit Los Angeles Pop Art's clearance section and save up to 70% on select items. Click link to get started. Los Angeles Pop Art offers great posters starting at only $2.00. Click link to see the selection. For a limited time Los Angeles Pop Art has t-shirts starting as low as $1.99 a piece. Buy yours soon as quantities are very limited.